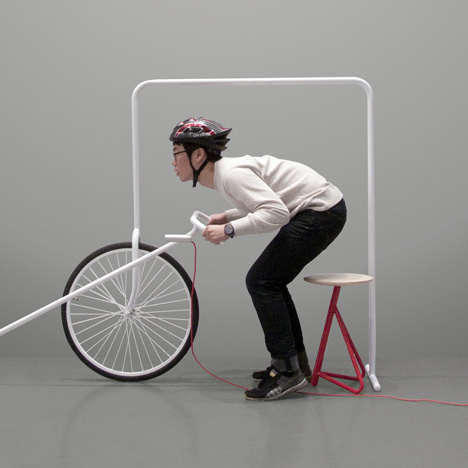 Seoul designers HawaSoo have designed a clothes rail, a lamp and a stool that are styled like components of a bicycle. Called Breeze, the collection features a lamp with a long pole and handlebar-like supports to lean against the wall, a red stool with one diagonal leg echoing the usual line of a saddle support and a rack for clothes with a wheel at just one end. See all our stories about bicycles here and all our stories about furniture here. Hi! We are HawaSoo that the project team is composed of 2 designers, SungHa Lee and Minsoo Park, who work in Seoul. We design what just interest us. So it seems that we are just a bit lazy, but we think design must be fun! Our works are actually interesting, and we are proud of ours. We love something fun and stories in it. The story we mentioned here is not a simple storyline like a fairy tale. It emerges with users’ experiences when people use the products. We hope that our design catches people’s interests and they find the hidden wit within the form. And we expect that it is not just a object but it creates a new story to people. ‘breeze’ is a furniture series that is designed with hidden various structures and functions in a bicycle frame. Lighting, hanger, stool have individual functions and systems however they form a look and a bicycle together with each other. When people use ‘breeze’, they can experience joyful activity from the bicycle. In addition, people will recognize the ‘breeze’ as a great bicycle.